Here's a fun little scarecrow card that I made up (x 10) to send to my family with recent pics of my daughter inside! I used this punch art tutorial as a basis for mine, but changed it up a bit with different eyes, hair, and hat. You can find the pattern for the hat via this coloring page. Inside I stamped a fall "Be Thankful" stamp (Inkadinkado). 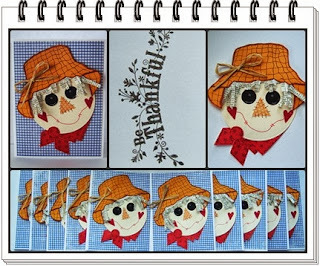 I just love your cute little scarecrow cards! This is fantastic. I especially like the newspaper strips coming from under his hat. This is so great! Love his hair and the sentiment inside is beautiful!